The Corporate world is brutal. Many new businesses try their luck here each year and only a handful of them are able to pass through unscathed. Most don’t survive. In fact, 5% of the total entrants don’t even see their first anniversary. It’s that bad. With every venture gone wrong, you lose a big chunk of fund, employees, and assets. It can be really painful to see your money and resources go awry, but don’t let your assets getaway that freely too. 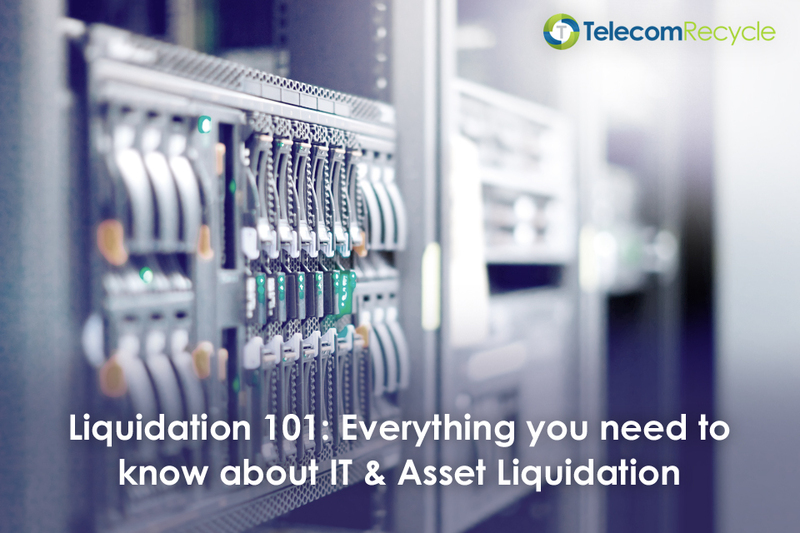 This article compiles everything you need to know about IT liquidation and asset recovery, so you can be prepared should that day arrive. What is Liquidation? Types of Liquidation Things to remember before Liquidating assets The process What’s next? Liquidation, in simple words, refers to the process of selling a company’s assets, thus resolving their operations altogether. There can be many reasons for businesses to partake in IT and asset liquidation – acquisitions are one, forced exits due to unfortunate circumstances is another. Several times, a company unable to make ends meet also go liquidation route to pay their creditors back. Around 215,000 United States firms were reported to have exited in the third quarter of 2016 resulting in 749,000 jobs lost, according to the Small Business Administration (SBA). Voluntary liquidation is when dealing with an insolvent company- a firm that is unable to pay their dues off to the creditors leading to complete shutdown of operations. Here, the liquidator assigned by the involved party (creditor) voluntarily begins an IT and asset liquidation process on the perpetrator. On the other hand, compulsory liquidation involves force shutting of company operations due to the wish of the majority of the creditors. This is often against the will of company directors. 1. Evaluate the total value of your assets (items that you are willing to liquidate) and document it: Create a detailed inventory if you must, this will help you set a benchmark for recovery. You may add physical details, photographs, warranty certificates, purchase information, and whatnot to make things easier to evaluate. At the end of the day, the means through which you liquidate your assets don’t matter, recovery does. So, whether it’s through one-by-one item sale, auction events, donations, or recycling, you’ll have a fair idea on what profits you can expect at the end. Starting a new venture won’t be a headache anymore. 2. Run your assets through quality checks and repairs before putting them up on sale. Such minor/major fixations will help boost the value of your assets, and thus final selling prices. 3. Hire a reputed liquidation company as your partner. Trust only a known IT liquidation provider to handle your valuable assets. This way you can rest assured with marketing, selling and recovering as much as possible from all the surplus and used IT equipment. Many prefer doing the deed themselves, but the time, efforts, and dedication required in selling stuff you are attached to is a great deal. 4. Donate items/inventory that isn’t much worth to extract tax benefits. If you have assets that you know won’t pose much value in the retail market, consider donating them to NGOs or local/regional centers. Contact your attorney or accountant before you take this step, though. They’ll give you an exact figure of the tax exemptions that come with such donations. It’s crucial to remember that these steps (especially the ones involving assets) should be taken BEFORE you work on the liquidation process. Because a company in liquidation no longer holds power on their own assets or entire property for that matter. The liquidator hired is legally responsible for all that. As a company undergoing liquidation, you would be guided end to end by the appointed liquidator. They carry the responsibility of collecting and labeling the assets, selling them off, paying back to creditors, and distributing the profits and funds to creditors. Responsibilities that could have been emotionally exhausting for you, if you were taking care of them alone. If you make the inventory list we’ve mentioned in the “Things to remember before Liquidating assets”, this step wouldn’t be as overwhelming for you or for the liquidator. You already have the viable assets under your radar and you know how much it’s worth of. You can very well move on to the next step with all this information in hand. Disposing of here can mean any of the following – selling, donating, or sending off for recycling. The end state of the asset heavily depends on their physical condition, variety, quantity, and market conditions. The last step is the most painful one. Once you’ve planned what’s going to happen to your loved assets, it’s better you back off. Your liquidator will take care of the rest for you while getting the best possible monetary recovery. If you have any further questions on IT liquidation and asset recovery management or if you need liquidation advice, you may drop us a line at bid@telecomrecycle.com or ring us up at 1-888-900-7605. Our liquidation experts are always here to help you. Call us today to get a free initial consultation!